Real silverware often develops a tarnished surface after regular use. 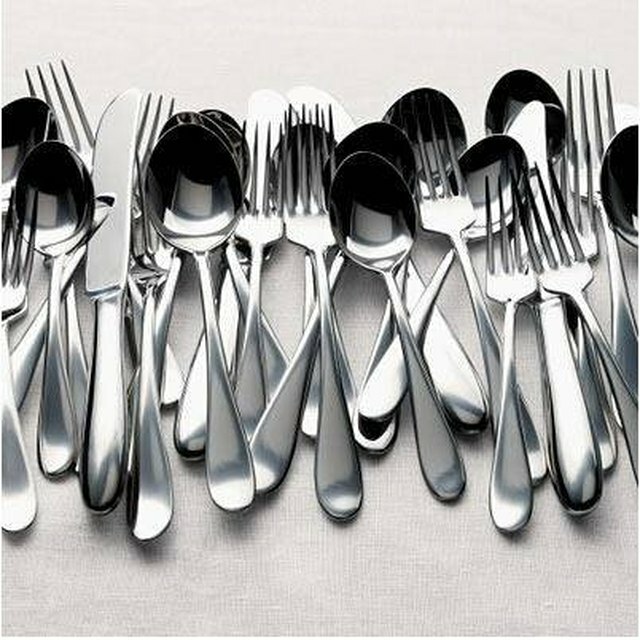 Since silverware comes in direct contact with the mouth, silver polishes are not recommended to return the silverware back to its original shine. A brief boiling session is a safe alternative to polishes and produces comparable results. A mixture of the proper items causes a chemical reaction that quickly brings the shine back to silverware. Even better, this technique requires very little manual work. Silverware tarnish removal doesn't have to be difficult. Fill a pot with 3 inches of water, or just enough to submerge the silverware completely. Add 1 tbsp. salt and 1 tbsp. baking soda to the water. Put the pot on the stove at high heat and bring it to a boil. Drop a sheet of aluminum foil in the boiling water. The sheet must be close to the same size as the bottom of the pot. Lower the silverware into the boiling water with a pair of tongs. Each piece of silverware must come in contact with the aluminum foil or another piece of silver. Remove the pot from the heat and allow the silverware to soak for 10 minutes. Remove the silverware from the water and wash, rinse and dry them.